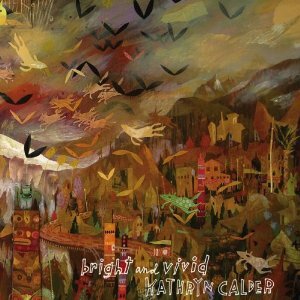 I’d like to start with a stupid old joke that I’m pretty sure I stole from someone else but is still one of my favorites: Kathryn Calder is easily one of my five favorite New Pornographers. OK, all bad jokes aside, Calder really is one of my favorite “new” artists. Not that Calder is new to the indie world, having worked with not only the aforementioned New Pornographers, but she was also previously a member of another great group of Canadian indie rockers, Immaculate Machine. What is new is that with this release Calder firmly establishes herself as a legitimate lead artist, not just Neko Case‘s fill-in, but a true indie starlet ready to make her mark. Bright and Vivid builds on the foundation laid by Calder’s first solo release, 2010’s Are You My Mother? a very nice album but nothing that really showed the true range or reach of Calder’s voice and talents. This new follow-up is a true departure from her prior solo work or associations with other groups, and establishes a unique sound that is all Calder. The complex sounds and wonderful orchestration on Bright and Vivid shows an impressive amount of growth in a short amount of time, not just in terms of production value, but also artistic expansion and experimentation. In fact, if there is any quibble to be had at all with Calder’s sophomore release, it’s that there are a couple of moments where it’s too well-produced and the intricate musical arrangements, while lovely, tend to step on Calder’s beautiful, delicate voice. This is at most a small problem though and ultimately, Calder puts forth a fine effort and one which makes me truly intrigued to see where she goes next. And even if (music gods forbid) this turns out to be her final solo record, she’s already ruined my stupid old joke. No longer is Calder the “not-Neko Case from the New Pornographers.” She is now just Kathryn Calder. Period.